The 3rd ranked Oregon Ducks, fresh off a National Championship loss to Auburn, stumbled yet again to an SEC opponent Saturday night as the LSU Tigers mauled them, 40-27. The 4th ranked Tigers proved that the suspension of starting QB Jordan Jefferson would not impact the game as LSU's running game racked up 175 yards and back-up QB Jarrett Lee turned in a mistake free night. 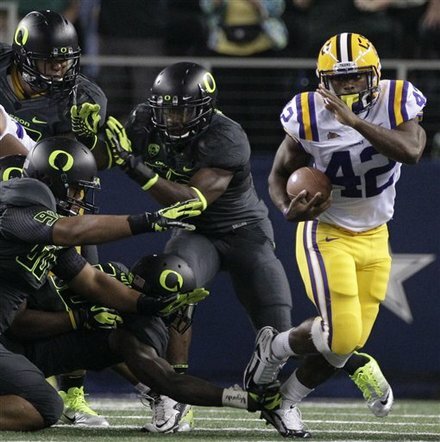 Heisman hopeful LaMichael James was held to only 51 yards rushing as LSU shut down Oregon's explosive spread offense. Oregon QB Darron Thomas said before the game that if Oregon does not win this game, it's a done season. It looks like LSU can continue it's pursuit for the National Championship and Oregon can only finish with Roses at best.